Clare Robertson has over 10 years’ experience working in theatre as producer and general manager, overseeing the planning, delivery and evaluation of theatre productions, managing international touring, creative partnerships and all financial, logistical and administrative aspects of running a theatre company. She is passionate about the potential of theatre to be a tool for social change and is particularly interested in fusing producing artistic projects with campaigning and advocacy. Clare is currently Producer (maternity cover) for Cardboard Citizens, who are internationally recognised for harnessing the power of theatre to give those affected by homelessness a voice and to bring about change in their lives. From 2015 – 2018 she was General Manager/Producer for Belarus Free Theatre, developing theatre productions, campaigns and educational activities for meaningful human rights change in Belarus and the wider region. Prior to that she was Producer and in charge of Artist Development for Rough Magic Theatre Company, Dublin and before that with the Gate Theatre, Dublin. 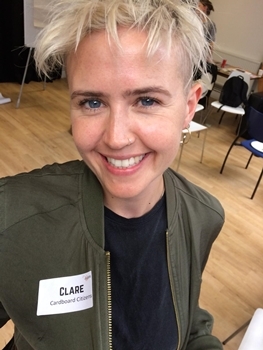 Clare holds an honours’ degree in English Studies from Trinity College, Dublin and is currently pursuing a Masters’ degree in human rights at Birkbeck College, London.